I came across some interesting resources that shared about what the location of our clutter tells us about ourselves. It is good to reflect to see if the observation is applicable to your life. Some of the items in blue italics are my own words based on personal experience. Fear of relationships or fear of new opportunity as the entrance is where people would come in. Unwillingness to examine our emotions. Note: When I was younger, my closet used to be a huge huge mess. Clothes were arranged haphazardly. I would tidy up the closet from time to time but it would grow into a huge mess in no time. Few years ago, I did a huge round of purge to my closet, threw out clothes that I do not wear or no longer fit and donated those that were still in good condition. I also created a system that works for me so I know where my clothes are and do not need to rummage through them. Resentment or being overwhelmed by caretaking as kitchen represents nurturing. Note: I noticed folks that do not particularly like cleaning and cooking but was more or less forced into the role would tend to have cluttered kitchen. If that is the case, no matter how many times you do purging or decluttering, the kitchen would come back messy and cluttered in no time. The key is to change our mindset and attitude, not taking adopting the role of nurturing with resentment but learn to do with joy. It is not going to be easy but it can be done. For example, all along I am a career woman working in the corporate world. Cleaning and cooking are something I am totally hopeless in. However as I transitioned into the role of a caregiver, and an unpaid maid through my own personal choice. I count my blessings that I have the means and ability to care for my mom at the time when she needs me the most. We seldom have time to spend together before this as when I grew up she was too busy working and after she retired it was my turn. I could always hire a maid and continued to work but it would be something that I may bitterly regret one day. At the same time, I feel grateful that I am given spare time to work on my blogs and at the same time deepen my own personal practice. With time, I was able to make myself accept and started doing chores with more happiness and joy. Desire for change or to escape. Note: I used to place a lot of books on the table next to my bed. These are books that I was supposed to get round to reading or learn from… offering skills to be what I had wanted to be. I had thought that placing these items near my bed would make it more probable that I would pick up the book and read but it is often not the case. In the end, I store these books at designated areas in my home such as my bookcase or storage box. Frustration/ fear of letting go or the need for control. Note: I would like to add that perhaps this should include clutter that we store in a spare room or storeroom. 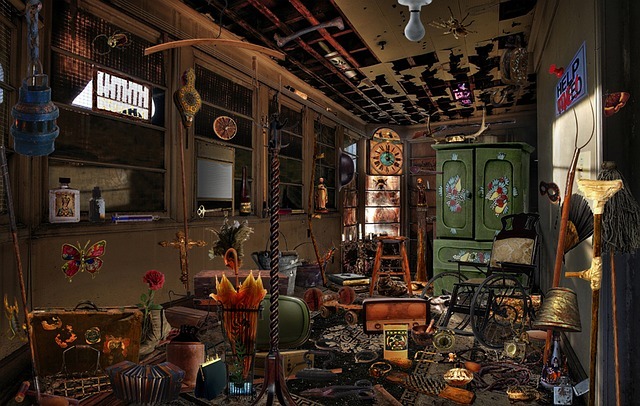 Mostly clutter are considered old items, heirlooms (some of which we may or may not like but cannot bear to part with). Somehow we are worried that getting rid of the stuff would disconnect us from the past or we will crave for the item later. Body image issues since the bathroom is where we can see our whole body naked. Note: This is not surprising because living room is where we invite people over and spend time to chit chat. Having clutter makes us ashamed of inviting people over. In the past, I used to have clutter in my living room. But when my mom became unwell, many people came over to visit us and I made myself clear off most of the clutter to make the living room look hospitable. This has an impact on our social life- subsequently I find myself connecting and opening up to more people. Now, regardless of whether there are visitors or not, I do my best to tidy and clear the clutter in my living room. Relate to issues surrounding your sexual self, fears of intimacy or gender roles. Note: I am not sure about the above, but having mess in the bedroom really disrupts sleep, make me more overwhelmed and not rested. A bedroom should be a place where your tired body and mind take a rest. It is the first thing you see in the morning when you open your eyes. A cluttered bedroom really push you backwards and would make you often mentally drained. I used to have a cluttered bedroom but have since cleared out all the stuff- but I am guilty of having a lot of the stuff moved to my storeroom instead (my next pet project is to declutter the stuff in my storeroom). Still, clearing my bedroom helps- my room has become my little refuge area and also a place I enjoy spending quiet time to read and research (and failing asleep halfway on my bed, hee hee). But overall, do your best to ensure your bedroom is as clutter free as possible. It makes a whole lot of difference to your emotional well-being.